Are you looking for a company to keep your commercial kitchen exhaust system squeaky clean? 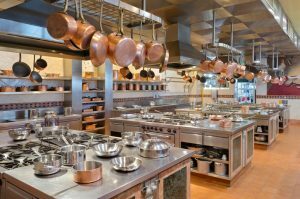 Is your restaurant, hotel, or other commercial kitchen in the Anaheim, CA, area? Then you’re definitely in luck, because Flue Steam serves the entire Anaheim area with quality exhaust system cleaning services. We’ve been providing impeccable services to Anaheim and all of Southern California for over 48 years, and we’d be happy to add you to our list of highly satisfied clients. One of the most fundamental aspects of your commercial kitchen is its exhaust system. Maintaining its cleanliness is essential to the efficiency and safety of your kitchen. The main purpose of your exhaust system is safely eliminating vaporized grease, which is a natural byproduct of cooking, and removing hot air and odors, too. If too much grease builds up in your system, a dangerous flash fire could occur in your exhaust ducts. 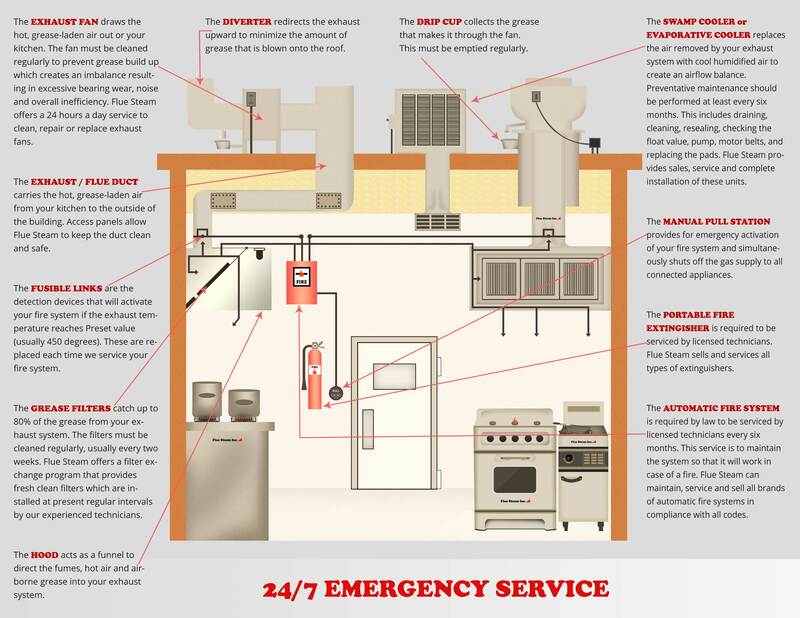 Don’t put yourself at risk of having a flash fire, which could seriously hurt someone, damage your kitchen, and hurt your bottom line, when you have to close for repairs. Keep your kitchen safe from flash fires and get real peace of mind everyday when you sign up for regular kitchen exhaust system cleaning services from Flue Steam. We’ve partnered with plenty of people in Anaheim and surrounding areas, who have found us to be punctual, thorough, and totally responsible. We highly recommend that you sign up for both steam cleaning and hand scraping kitchen exhaust system cleaning services. Hand scraping is a simple, effective, and affordable way to remove grease deposits from all accessible areas. Many businesses sign up to have hand scraping done once a month. Steam cleaning involves more specialized equipment, which utilizes hot, high-pressure water to remove every little bit of grease from your exhaust system. Many businesses choose to supplement monthly hand scraping with thorough steam cleaning 2-4 times per year. Depending upon the amount of grease your staff uses on a daily basis, we’ll be happy to recommend certain frequencies of hand scraping and steam cleaning services. If you operate a fast food restaurant, you’ll naturally need to sign up for more frequent cleanings, since frying results in enormous amounts of vaporized grease in your exhaust system. But if you have a sushi restaurant, less frequent cleaning will be necessary. After our technician successfully cleans your exhaust system, he or she will place a Certificate of Performance sticker on your exhaust system. This indicates that you have met your NFPA code obligations. Our stickers keep code inspectors highly satisfied, plus they may even help you save money on your insurance bills. Talk about a win-win! Ready to begin your partnership with Flue Steam? Still have questions! Let’s talk! Call us at 800-700-FLUE today. We’ll be happy to discuss your needs and provide you with an estimate for all recommended services.